Search rank is important. You want your website or content on the first page of a Google/Bing/Yahoo/Aol/etc. search because most people don’t bother looking at the second page of search results. But what’s the most effective way to improve your ranking? I’ve been asked recently by a few people who have a website for their business, “How can I get my website higher in a search?” We’ve heard of Search Engine Optimization (SEO), but what does it entail? SEO helps you position your website properly to be found at the most critical points in the buying process or when people need your site. The goal of SEO is to create a seamless user experience and communicate to the search engines your intentions so they can recommend your website for relevant searches. Themes given to the content, the page text and the titles and descriptions given. Speed and function of your site. Is it working properly? Is your content is good enough for other sites to link to or reference. A user experience that is easy to navigate, is safe and has a low bounce rate. Implement social media integration such as Facebook, Twitter, LinkedIn, email, etc. 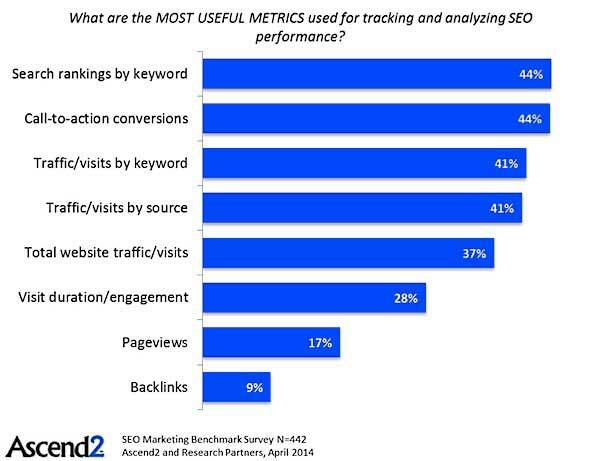 So which SEO strategies are the most effective? 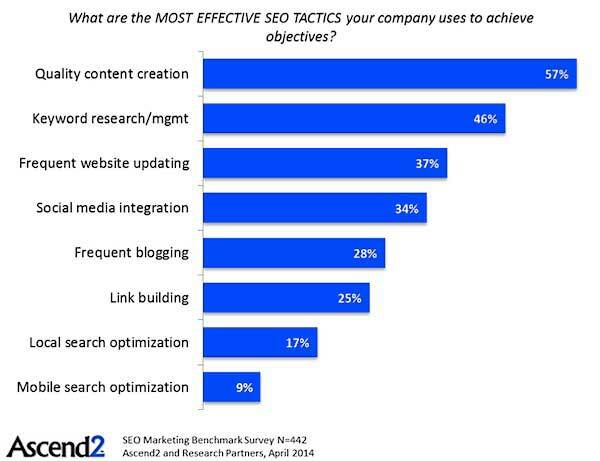 A recent survey by Ascend2 found that more than half (57%) of the global professionals polled say quality content creation is one of the most effective SEO strategies employed by their company. 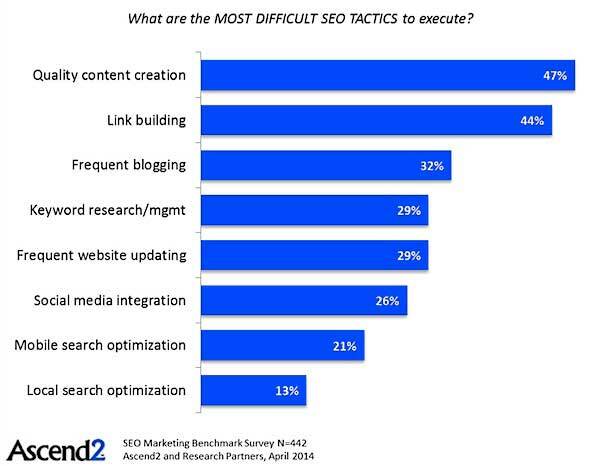 Other effective SEO efforts include keyword research and management (47%), frequent website updating (37%), social media integration (32%), and frequent blogging (28%). 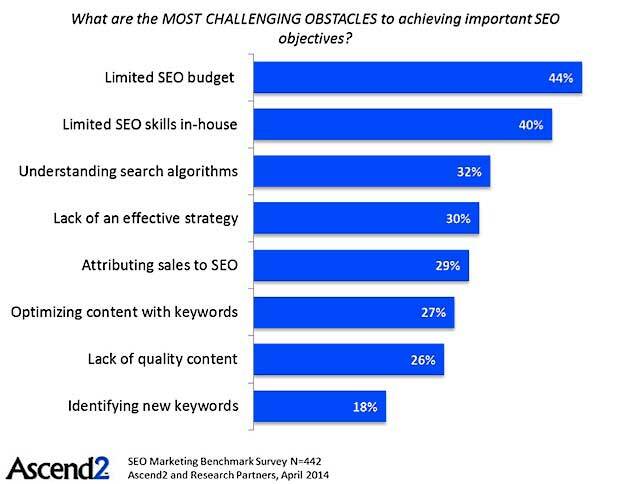 See the charts below pinpointing the most effective SEO tactics, most difficult, most useful analytics and the most challenging obstacles. Hopefully this data will help you pinpoint areas to work on for your own content. And some of these are really simple but important. It could open up a larger audience and new possibilities for you. About the research: The report based on data from a survey of 442 marketing and sales professionals from around the world (63% US-based, 16% Europe, 6% Canada, 15% other).